PETALING JAYA: Property player Mah Sing Group Bhd is seeing increasing interest by investors and some analysts reckon the company is emerging nicely as a steady proxy to the Malaysian property sector. The company's shares appreciated by some 16% over the last two weeks. However, it closed one sen down at RM2.41 yesterday. “Given a changed competitive landscape, Mah Sing's ascendancy under the stewardship of its major shareholder Tan Sri Leong Hoy Kum should now firmly solidify its valuation from long overdue market recognition of its entrepreneurial spirit in driving net asset value growth,” said AmResearch in its initiation report. In a poll of 14 analysts by Bloomberg, 10 analysts have a “buy” rating, three analysts have a “hold” rating while only one has a “sell” call. The consensus target price is RM2.54, while the consensus net profit for its financial year (FY) ending Dec 31, 2012 is RM220mil, and RM286.36mil for FY13. Yesterday AmResearch rated a fair value of RM3.60 for Mah Sing, based on a mid-cycle discount of 25% to its estimated net asset value of RM4.80 per share. This fair value implies a price earnings of 12 times (x) on FY13 net income of RM260.2mil. Its two large township projects would be its soon-to-be-launched Southville City in Bangi, with a gross development value (GDV) of RM2.2bil as well as the M Residence in Rawang, Selangor. Mah Sing has a net gearing of 33%. It has bought over RM1bil worth of land in the past four years with about RM11bil in GDV. AmResearch said that this year, the group had secured three parcels of land which will yield a total GDV of RM3.63bil or accounting for 73% of its 2012 GDV replenishment target of RM5bil. It currently has total estimated GDV of RM16bil. “Mah Sing is well known for its small, niche, fast turnaround developments as the group does not own a single parcel of land bigger than 400 acres until the recent acquisition of the Bangi land,” said AmResearch. “In the first quarter alone, it sold RM676mil worth of properties or a 21% growth year on year. Key contributors include Kinrara Residence, M City and M Residence 1,” said AmResearch. AmResearch forecast earnings to expand by 24% to RM209.5mil in FY12 before growing by another 24% to RM260mil in FY13 and reaching RM320mil in FY14 in line with management's earnings growth target of 20%-25% per annum. Industry observers also point out that part of the reason why Mah Sing is getting more attention now is due to a slight lessening of interesting in market leader SP Setia Bhd. For close to a decade, SP Setia has held the spot of sector leader. However, the takeover of SP Setia by Permodalan Nasional Bhd (PNB) last year at a price of RM3.90, has seen its sector leadership being increasingly discounted, and this is evident from its share price. Last month, SP Setia chief Tan Sri Liew Kee Sin exercised his put option for the first time, reducing his stake to 5.88% from 8.23%. The 2.35% block was worth RM178.53mil based on the transacted price of RM3.95. With that exercise, PNB has a 73.06% stake. SP Setia closed the day at RM3.53 down 7 sen.
Liew and PNB have entered into an agreement where Liew will continue to steer the company for a three-year period, and with no board changes during that time. Interestingly, many analysts have said that the departure of Liew would see them downgrading SP Setia. Pelaburan Hartanah Bhd owns the land where the Unilever headquarters and factory once sat. KUALA LUMPUR: Pelaburan Hartanah Bhd (PHB) has shelved all proposals from several companies to develop a prime 8.09ha site on Jalan Bangsar in Kuala Lumpur, its chief said. PHB, a unit of Yayasan Amanah Hartanah Bumiputera and Mayban Investment Management Sdn Bhd, owns the land where the Unilever headquarters and factory once sat. It has received proposals from companies like Mah Sing Group Bhd, Malaysian Resources Corp Bhd (MRCB), SP Setia Bhd, UEM Land Holdings Bhd and Land & General Bhd. Business Times reported recently that MRCB had emerged as the front-runner to secure the land development job, which is estimated to generate more than RM5 billion in gross development value. However, PHB managing director and chief executive officer Datuk Kamalul Arifin Othman said it is not in discussion with any parties currently. 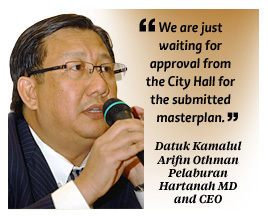 “We are just waiting for approval from the City Hall for the masterplan that we submitted to them early this year. “Once the masterplan has been approved, we will decide on what to do next,” Kamalul told Business Times via a telephone interview recently. PHB may award the contract to develop the land to one party or parcel it out to several property developers. “This is a huge project that requires proper master planning. We want it to be the next mega development for Kuala Lumpur,” he said. Current developments in Kuala Lumpur include the MRCB’s KL Sentral integrated transport hub in Brickfields, SP Setia’s KL Eco City and Setia Federal Hill and the RM26 billion Tun Razak Exchange. Set up by the government in 2006, PHB is to facilitate Bumiputera ownership in prime commercial real estate. Meanwhile, Mah Sing – one of the interested developers – said it is waiting for a final decision from PHB on the status of its proposal and the land development plan. “PHB has not come back to us. So we believe we still have a chance to bank the job. “We think the contract would be awarded after the elections,” its managing director and group chief executive Tan Sri Leong Hoy Kum told Business Times. PETALING JAYA: Naim Holdings Bhd's stock is said to be undervalued after considering factors such as the group's real estate assets, earnings visibility and 34% stake in associate Dayang Enterprise Holdings Bhd, according to research analysts. The group, headquartered in Kuching, Sarawak, was in the limelight recently after its wholly-owned subsidiary Naim Engineering Sdn Bhd won a RM208.2mil contract for one of the work packages for the My Rapid Transit (MRT) project in Kuala Lumpur. Naim Holdings is involved in property development, and contracting of construction, civil engineering, oil and gas and infrastructure projects. According to Bloomberg data, the major shareholders of Naim Holdings include Island Harvests Sdn Bhd (12.25%), Tapak Beringin Sdn Bhd (10.96%), Lembaga Tabung Haji (10%), managing director Datuk Hasmi Hasnan (6.67%), Skim Amanah Saham Bumiputra or ASB (5%), Employees Provident Fund (5%) and chairman Datuk Abdul Hamed Sepawi (4.86%). Hasmi is also the chairman of Dayang Enterprise. The group's market capitalisation is RM472.5mil. The stock closed 5 sen higher to RM1.89 yesterday. TA Securities Holdings Bhd analyst Ooi Beng Hooi pointed out that Naim Holdings' 33.63% stake in Dayang Enterprise, which is a service provider to the oil and gas industry, is worth RM379.1mil or RM1.51 per Naim Holdings share (based on a price of RM2.05 per Dayang Enterprise share). “Also, Naim Holdings has an undeveloped land bank of 2,620 acres in Sarawak with an estimated gross development value (GDV) of RM9.5bil,” said Ooi. The group's flagship property developments are Bandar Baru Permyjaya in Miri, Desa Ilmu in Kota Samarahan, and the up-market Riveria satellite township in Kuching. TA Securities is maintaining a buy call on Naim Holdings' stock, with a target price of RM2.26 per share. Meanwhile, Kenanga Research has an outperform call Naim Holdings' stock, with a target price of RM2.94. In a recent note, Kenanga Research said it was neutral on the MRT contract as it was within the research unit's financial year 2012 annual order book replenishment of RM500mil. The research unit said to date, Naim Holdings' outstanding order book stood at RM1.3bil, including the MRT contract, which would provide earnings visibility for the next four years. “The next re-rating catalyst for Naim Holdings will be additional new contracts secured this year. Thus far, the group has secured RM500mil worth of new contracts this year,” said Kenanga Research. An industry source also reckoned there was plenty of share price upside potential for Naim Holdings within a two to three-year horizon, based on new property developments and possibly more government construction contracts in Sarawak. The source pointed out that Naim Holdings would develop the site of the old Bintulu airport into an integrated upmarket commercial and residential project, with a GDV of RM2bil. “Also, look at the proximity of the fast-developing new Samalaju Industrial Park, where international companies have invested, to Bintulu. A new RM1.8bil Samalaju Port project is also ongoing in Bintulu. So, there is strong potential for lucrative property plays for Naim Holdings,” said the source. Meanwhile, HwangDBS Vickers Research said Naim Holdings' MRT contract win underpinned its competitiveness, as it is the first East Malaysian contractor to be awarded one of the main packages of the MRT project. The research unit also said property sales remained robust in Sarawak, supported by the booming oil and gas industry. Naim Holdings' unbilled sales stood at RM176mil, and the take-up for its new launches has been strong. It should be noted that last year, Naim Holdings posted a significant 52.3% drop in net profit to RM46.6mil, compared with RM97.75mil in 2010. 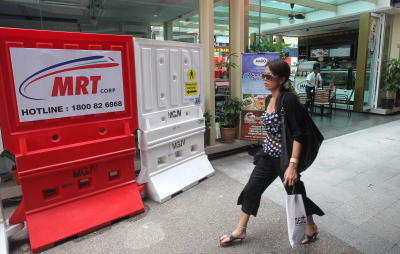 Revenue dropped 32.8% year-on-year to RM411.9mil for the year ended Dec 31, 2011. In its 2011 annual report, Naim Holdings pointed out that last year was only the second time in its 16-year history that the group has performed below expectations. However, the group was confident the results were only a temporary setback due to factors such as the slowdown of Federal Government funding for major infrastructure projects in Sarawak, and the nationwide decline in construction margins. Naim Holdings had posted improved results for the first quarter ended March 31, where its net profit grew 31.5% year-on-year to RM16.1mil. Revenue was 22% lower to RM94.2mil for the quarter under review, and the group attributed the earnings growth to improved margins for its construction segment as well as better performance of its associates and joint ventures, and a decrease in administrative expense. HwangDBS Vickers Research said an earnings recovery on the horizon for Naim Holdings, and its balance sheet remained strong with 17% net gearing (as at March). WE are upgrading our recommendation on IJM from a “market perform” to an “outperform”. Our upgrade is mainly premised on our in-house upgrade of IJMLand’s target price coupled with its still ample upside (+12%) from the current share price. Following the recent news on the Selangor water issues, we understand that IJM’s joint venture (JV) project for the Pahang-Selangor Water Transfer Project (PSWT) is currently progressing well at above a 50% completion rate with the project financing, with Japan Bank for International Cooperation (JBIC), still intact. The management is in discussion with the Government to revive the NPE extension project with a new alignment, although the outcome is not likely to be decided in the near term. Its associate, Kumpulan Europlus (KEURO) is expected to make the announcement on the finalisation of the West Coast Expressway (WCE) concession in the near term. There are no material changes in our forecasts at this juncture, but we have increased our target price higher from RM5.56 to RM5.74 (+3%) following our upward revision on IJMLand’s revised net asset value (RNAV) for its property project in the United Kingdom. We understand that there are concerns on the funding of the on-going PSWT project due to the fiasco in the Selangor water industry. To recap, a consortium led by Shimizu was awarded a RM1.3bil tunnelling (45km) contract for the PSWT project at the Pahang site. IJM holds a 20% stake in the consortium together with UEM Builders (20%), Nishimatsu (30%) and Shimizu (30%). The project is slated for completion by late 2014 and management reiterated that JBIC is still financing the project. We understand that the management is currently meeting with the Government to refresh the alignment of the proposed NPE highway extension project. In our view, this could be due to the feasibility of the project and the competition with the existing Besraya Expressway. Nonetheless, we do not expect the outcome to be out in the near term as the discussion could be prolonged due to land acquisition and final agreement on the concession terms. In the meantime, the management expects its associate KEURO to announce the update on the signing of the concession agreement for the WCE highway project. In a nutshell, IJMCorp will likely be running at its full capacity after securing the WCE highway construction works. Its current order book now stands at about RM1.7bil for the next two to three years. We opine that its earnings visibility is fairly clear at this juncture while the potential WCE highway construction project will provide an additional three years’ earnings visibility to the group. Risks involved would be the cancellation of the WCE project, a spike-up in material prices, a sharp decrease in CPO prices below RM3100 per metric tonne and slower take-ups for its property projects. There are no material changes to our forecasts at this juncture even with IJMLand’s recent venture into the UK property market. We have already factored in new contracts worth RM6bil for FY13, which will be mainly driven by the construction of the WCE highway (RM4bil to RM4.5bil). SINGAPORE: The Housing Board (HDB) will deliver at least 20,000 new flats next year. That is the promise National Development Minister Khaw Boon Wan has given to Singaporeans in a bid to increase home ownership. “I expect this sustained supply to firmly stabilise the housing market. This will give Singaporeans many options as they make their flat purchases prudently and wisely,” said Khaw on his Housing Matters blog. The latest infusion of flats comes on the back of the 50,000 flats already promised for the past two years. The government was also making steady progress in helping newly-wed first-timers land their HDB flats, going by the application rates for the latest Build-To-Order launch, he said. Application rates for first-timers, or those that have yet to take up a housing subsidy, is 1.7. “This means that almost all first-timers will get the chance to select a flat when they apply for one, especially in non-mature estates,” he said. NEW DELHI: Shares in India's biggest property developer DLF rose after posting better-than-expected earnings for the three months to June. DLF, controlled by billionaire Kushal Pal Singh and his family, reported late Monday that net profit fell 18% to 2.9 billion rupees (US$53mil) in the fiscal first quarter, from 3.58 billion rupees a year earlier. The figure topped the 2.6 billion rupee profit forecast by analysts in a Dow Jones Newswires poll, sending its shares 1.44% higher at 214.35 rupees in morning trade yesterday. Sales during the quarter slumped 10% to 22 billion rupees from a year earlier as buyers held off on purchases as Asia's third-largest economy falters under the impact of heavy borrowing costs and the weight of a global economic slump. During the property boom years in the middle of the last decade, DLF took advantage of inexpensive interest rates to build homes, offices and malls. But its performance now is a far cry from when it announced a full-year profit of US$1.5bil for the financial year 2007-2008 at the top of its earnings cycle and DLF boasted market capitalisation of US$40bil. Now the capitalisation figure is down to a little more than US$6bil. DLF has been battling to sell assets as it struggles to pare debts totalling 227 billion rupees. Interest costs climbed 265% to 6.2 billion rupees during the quarter. The company has lately been focusing on its home turf of northern India, easing up on plans to pursue a nationwide strategy. NEW YORK: Office building landlord Boston Properties Inc reported quarterly funds from operations, a key measure of real estate investment trust performance, that easily surpassed Wall Street's forecast, in part due to termination income from a tenant at one of its largest buildings. The company, whose chairman and chief executive is publisher Mortimer Zuckerman, reported second-quarter funds from operations (FFO) of US$206.8mil, or US$1.38 per share, compared with US$181.6mil, or US$1.24 per share in the second-quarter 2011. Analysts on average expected Boston Properties to post second-quarter FFO of US$1.24 per share, according to Thomson Reuters. The company had forecast second-quarter FFO in the range of US$1.23 to US$1.25 per share. FFO removes the profit-reducing effect that depreciation, a non-cash item, has on earnings. Boston Properties owns or has interests in properties that are mainly first-class office buildings in New York, Boston, San Francisco and the Washington DC area. DREAMWORKS Animation yesterday said it plans to build a US$3.2 billion (RM9.8 billion) theme park in Shanghai, as the US film giant seeks to bolster its presence in the booming Chinese entertainment market. The studio's newly formed China joint venture, Oriental DreamWorks, is set to open the theme park in 2016, the creator of megahits like "Shrek" and "Kung Fu Panda" said in a statement. The 20 billion yuan (RM9.8 billion) project - called the Dream Centre - will comprise entertainment facilities, animation exhibitions and commercial developments including hotels and shopping areas in Shanghai's Xuhui district, it said. The announcement comes after Walt Disney, another US entertainment giant, last year broke ground on a planned US$3.7 billion theme park in Shanghai which is scheduled to open in 2015. DreamWorks in February said it planned a US$330 million joint venture company with three Chinese partners - China Media Capital, Shanghai Media Group and Shanghai Alliance Investment. Yesterday's statement posted on DreamWorks' website said it had formally established the joint venture with the partners, all state-backed Chinese firms which together hold a majority 55 per cent stake in the venture. The company will make the next "Kung Fu Panda" movie, the third instalment in the series, in China as a co-production for release in 2016. China's box office grew an annual 35 per cent to US$2.0 billion in 2011, making it the second largest international market behind Japan, according to the Motion Picture Association of America. KUALA LUMPUR: Sunway Real Estate Investment Trust’s (Sunway REIT) pretax profit for the financial year ended June 30, 2012, fell to RM420.46mil from RM553.66mil in the same period last year. Revenue, however, rose to RM406.43mil from RM327.42mil previously. In a filing with Bursa Malaysia yesterday, Sunway REIT said the retail segment’s revenue rose 23%, or RM54.7mil, to RM292.3mil due to a rental reversion in Sunway Pyramid Mall and better contribution from Sunway Putra Mall. It said the hotel segment registered gross revenue of RM71.6mil, an increase of 28.6%, or RM15.9mil, compared with last year. “The strong revenue growth was primarily contributed by Sunway Putra Hotel of RM9.1mil and hotel properties located in Sunway Resort City of RM7.3mil,” it said. Sunway REIT said the office segment for the financial year recorded gross revenue of RM42.6mil, up 24.6%, or RM8.4mil, from last year, attributable to the addition of Sunway Putra Tower, which mitigated the drop in occupancy at Sunway Tower. On its prospects, it said domestic demand would provide the support to sustain the economy amid softer external demand. Sunway REIT said it would continue with its capital management programme in view of the accommodative monetary policy and was committed to distribute 100% of its distributable net income for the financial year ending June 30, 2013.